I am current farming about 120 acres. 70 of those I own outright, and 50 I lease under various agreements. I'd like to add another 40 to 60 acres this year, and this is basically how I'm doing it. For a variety of reasons I'm going to not mention the area that I'm looking in. I don't want to provide a road map for folks who would then compete with me, but I will describe the basic steps I take to find land to farm. There's two parts to this search: finding land that will work for me, and reaching an agreement with the owner of that land that meets everyones needs. What I look for are relatively level large areas, hopefully with other parcels around them that I might be able to farm as well. The bigger the better. If I can assemble 40 or 60 acres close together it means I have a shorter distance to travel when moving my equipment, and less moving means more working hours, which is good. The first step is to just drive around looking. I'm looking for fields that are either fallow or show signs of neglect, or are used for very-low-value crops, which in this area is probably local grass hay. If they're growing something costly I'll tend to skip that acreage, at least initially. 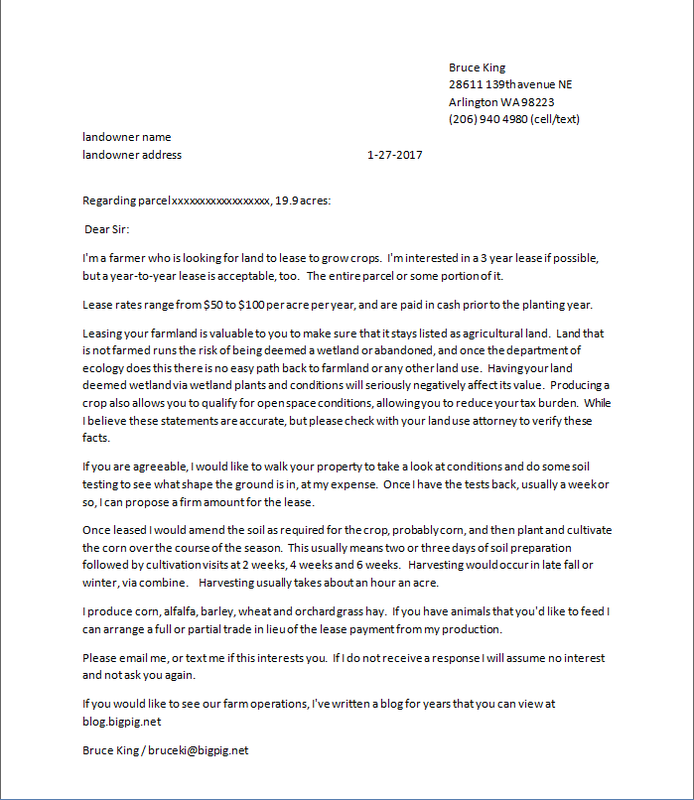 In my case I'm after 40 to 60 more acres, so I'll send this letter out to roughly double that number of acres, 120. It turns out that a bank I do business with has foreclosed on a 90 acre parcel in the area I'm looking at, so I'll also call the bank manager I know and see if I can lease that parcel as well. 90 acres is much more than I need, but I could then do a crop rotation on it. I hand-write the addresses on the envelopes and stick a stamp on them by hand. Hand written letters get opened more than printed ones, and each one is signed as well, by hand. In this case I ended up sending out 12 letters. and I'm happy to prove them wrong. Most of the land around me that remains undeveloped is the least-attractive land to develop. That is, those areas that are subject to seasonal floods, in the flood plain of a river or stream, are wet for a portion of the year, or have some other reason that they haven't had a house built on them. So one basic service I'm providing for the landowner is that I'm protecting them from this unpaid conversion. If the land is deemed a wetland it's worth a heck of a lot less than it is as farmland. Another basic service is that I'll typically work to improve the property by clearing vegetation and weeds that usually have grown up, to the fence lines if I can. This can be a large job on neglected acres, but I've got the equipment and experience to do a good job of it, and afterwards the land is available to the owner again. Sometimes I'll trade clearing a fence line for the use of the land behind the fence so the owner can build or repair a fence, or to make surveying easier, or improve sight lines from there house. 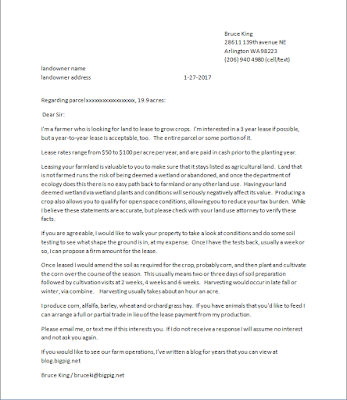 The final benefit that I offer the landowners is that I provide proof that a crop was produced, and my lease payment per-acre typically more than covers the property tax. If it doesn't I encourage the landowners to have their property declared open-space agriculture, which allows them to be taxed as agricultural land and can result in a reduction of the property tax bills of more than 90%. I'm not an attorney, and there are some drawbacks, but most landowners who own agricultural lands should be in the open space program in my opinion. Once I've got an indication of interest I'll go and walk the property in February when conditions are usually at their wettest and muddiest, and I'll have the soil tested, and based on that I'll make a firm offer on the land. Some properties want year-to-year leases, others are good with multiyear. If I can get multiyear it makes sense to do amendments to the soil (primarily lime, a natural rock soil amendment) and think about a crop rotation. if it's not in the cards, a single year crop of corn and talk to the owner again next year. So I'm mailing out the letters monday January 30th and I'm optimistic that I'll be able to add the 40 to 60 acres to the area that I farm this year. It's funny when publications that purport to be ethical steal from people. In this case they liked my picture of my mean black pig so much that they stole it outright. Shame on you, Stem Cell Ethics Education! Shame! $220 million to make egg-free mayonnaise? There's a segment of society that is so sure that traditional food sources are bad that they're willing to put up hundreds of millions of dollars. In this case it's to make artificial chicken eggs, and mayonnaise. I'm all for innovation, and if the were able to make a product that was better for the world, sure, people are free to eat whatever they like. But according to bloomberg they seem to have been playing funny games by buying all of their own product off of store shelves. To the point that they sold $472k in product, but apparently spent $510k buying it back in the same month. My opinion? Looks like they found some gullible investors trying to do the right thing, and took them in and sheared them. Shaved the wool right off. And laughed all the way to the bank. So you guys who live in the midwest or anywhere where you get real winter weather are going to laught at me, but 10 degrees F (-12 degrees C) is pretty darned cold for around here. We're definitely in winter operations mode right now. Most of the year the pigs are out on the pasture; I offer barn shelter to them free-choice, and most of the pigs choose to sleep in the barn every night, but occasionally groups will do sleep-overs in the pasture, depending on how they feel. But that's when the grass and crops are growing. During the winter the key goal is to maintain the roots and plants on the pasture until they start growing again, so into the barn they go for the non-growing season. It's a little more work to have them in the barn; mostly feeding, but in cold weather, like now, watering takes a bit more work, too. At these temperatures water doesn't stay liquid, and hoses freeze, and pipes burst. The picture above is of the feeding area for the pigs; there's a gate on either end. I'll use a tractor and spread out a layer of produce over the whole aisle; probably 2 tons or so of fruits and vegetables and bread and so on, and then pull the tractor out, open the gate, and the pigs, who have been waiting impatiently on the other side of the gate, flood in. With enough floor space every pig is able to find a patch of ground to forage, and they pretty quickly eat everything thats on the menu. takes them about 20 minutes to consume everything here. you'll notice that the alley has been narrowed with concrete blocks. I do that so that the alley is 6" wider than the bucket of my tractor - makes it easier to get the whole aisle clean in a single tractor pass. The floor itself has grooves formed into it that run the length of the aisle, and the whole thing is graded so that the far end of the picture is about 6" lower than the near end - that way any liquid runs downhill and out of the barn. Right now any liquid mostly freezes solid though, so I get it when I scrape the barn. 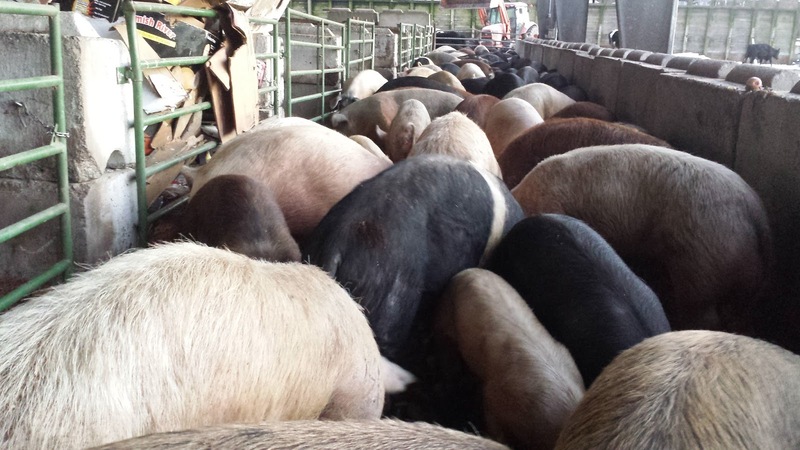 I'll let them pick through everything overnight - some of the pigs will stay up all night nosing through every inch of the feeding area, and by morning i'll find them all snoozing in a pig pile in the sleeping area. I'll close the gate, bring the tractor in and scrape the concrete floor of the barn clean. 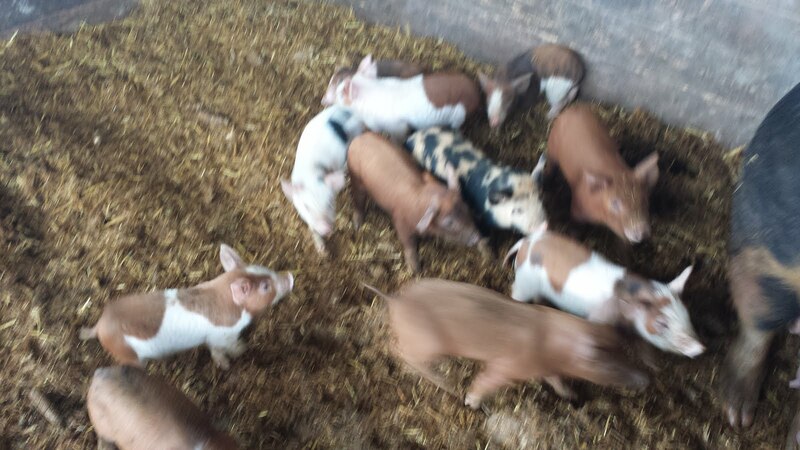 What comes off the floor is a mix of things that the pigs just don't like very much. orange peels (they eat the orange itself), onions and potatoes are the most likely left overs. If there's a lot of onions and potatoes I'll scoop that up and put it where the cows can eat it to get as much use out of the food as I can. the rest gets placed into the composting area, where it'll stay until early planting season, which is usually sometime in april around here for corn. After scraping the barn I check on the water supplies; in a pinch I use sheep troughs and a hose, and carefully drain the hose and detach it from the frost-free faucet after use. I've had decent luck with using my pig water setup. There's usually enough activity on the waterer to keep it from freezing solid. If it does freeze it usually breaks one of the fittings, so it's a buck or two to fix it and 10 minutes with a pipe wrench. If it does break the biggest nuisance is that the water sprays until I find it, and that can mean for some pretty amazing ice sculptures. I'm mixed about whether fixing it is worth avoiding the trough setup. so far I've been fixing it, but I'm always interested in 4 season solutions. Anything that cuts down on daily work is good.